I decided it was time to try to knit a more advanced project. I have been going to a knitting group at the Greenberry House a cozy place in Meadows of Dan , Virginia where Leslie the shop owner, and seasoned knitters help us beginners with our knitting skills. I have come to understand how to read knitting patterns. 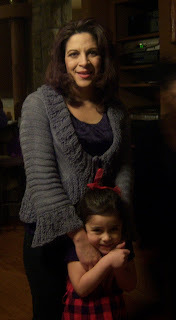 I found this free cute Paris Cardigan Sweater pattern from http://www.lionbrand.com/ website This sweater is titled April in Paris Cardigan. I chose to change the colors, and leave off the pockets.This is done in the seed stitch.. See my progress in pictures. This is one of the sleeves. The front of the sweater. This the collar which was worked with the fun fur yarn, 2 colors at the same time. It gives the collar a soft look, but also since it is doubled it gives it a weight which helps the collar lay right. Putting it all together, was a bit of a challenge. The back needs to be sewn to the front first, then the sleeves. 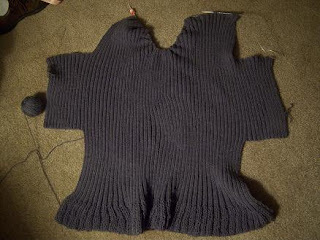 My tip is to pin the sleeves to the back and front with safety pins, and adjust as needed before actually sewing together.This will keep the sweater looking more even, and professional.. This is my first try at making big girl clothes.I found this darling vintage pattern from the 40's. This knitted short sweater jacket appealed to me because it looked trendy, short with flowing sleeves, and flowing neck line. I also liked that it did not require buttons. 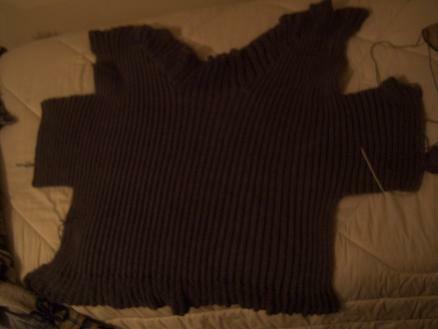 It is knitted from the bottom up, the sleeves are knit into place, instead of having to attach them..The the sweater is folded in half and sewn at the sides. Back: With size 15 needles cast on 184 sts. First row: k1 * p2, k2; repeat from *, end p2, k1. 2nd row: p1, * k2, p2; repeat from *, end k2, p1. Repeat these 2 rows for 4 inches for frill, end with 2nd row. Change to size 4 needles, continue for ribbing for 62 rows above the frill, end with 2nd row. Bind off 47 sts at beginning of each of next 2 rows. Next row: Work 77 sts and slip on holder for half of the front, work 33 sts and slip on a strand of yarn for neck edge, finish row. Continue ribbing on last 77 sts; work 6 rows even. Dec. 1 st at neck edge every 2nd row 24 times, then every row 8 times, end at neck edge. Change to size 15 needles and continue ribbing for 4 ins. Bind off. Frill on sleeves: With size 4 needles and working from right side pick up and k 96 sts on edge of sleeve. Change to size 15 needles, and work ribbing for 4 ins. Bind off. Finishing: With wrong side of frill to turn back on right side of jacket, sew side and sleeve seams, Steam. My beautiful daughter-in-law is modeling this sweater, I did add 2 string cords so it could be tied together. Good side view of sleeves. 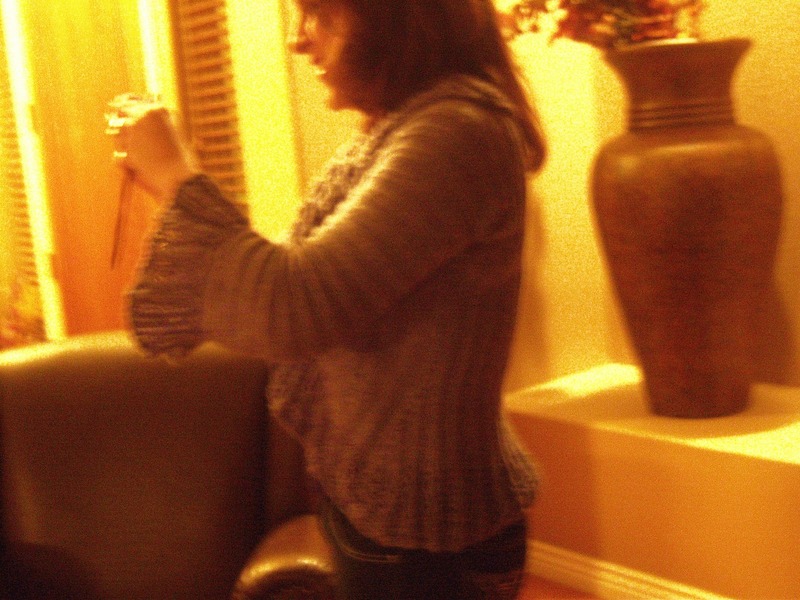 The side view photo did not turn out sharp, and as clear as I would have liked it, but you can get an idea of what the sweater looks like from the side it's cute, cute, cute. Are you running out of quick meal ideas? How does Sloppy Joe's from scratch sound? It doesn't take that long to prepare. You may already have most of the ingredients in your kitchen. Try this one and tell me what you think. ketchup, apple cider vinegar, Worcestershire sauce, and brown sugar into the frying pan. Cook til sauce thickens about 10 minutes. Server immediately over warm hamburger buns. I like to add a slice of tomato, onion and cheese on mine. This video illustrates the steps I take for painting designs on the children size tea pots. I throw my pottery from hand on a wheel. I paint, my own designs. I hope you enjoy this let me know.